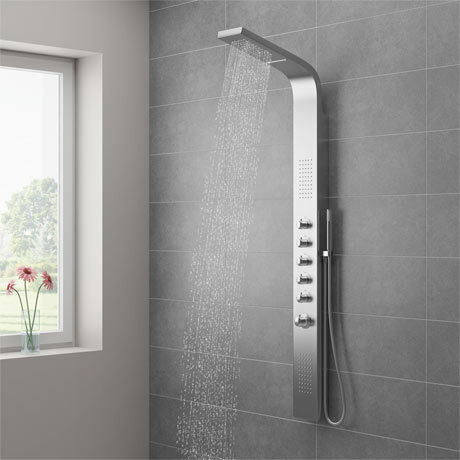 The stylish Milan tower shower panel features a stainless steel finish for a clean, contemporary look, this shower panel includes a quality inset fixed square shower head with a spa-like waterfall option, a stylish chrome shower handset on a flexible hose and 2 massaging inset body jets. The is designer shower panel is the perfect complement any modern minimalist bathroom. Nice looking. Replacing similar. Quick and efficient delivery However a pallet crate is rather excessive for a well packaged shower box. Leaving me problem of disposing large wooden crate. This is an excellent product which offers a number of spray options to meet all your showering needs. Fantastic product looks great will be a great addition to our home. It's a great item!! Good looking also.